For many adults, dealing with an aging parent and ensuring that they are cared for can be a challenging issue. More specifically, the dilemma of moving a parent out of the place they’ve called home for many years, and into a living home or community for the elderly, can be a hard one for both sides of that relationship. It’s a topic that is delved into on a very human and intimate level in In the Bleak Midwinter, the new play from Emmy award-winning actor/writer/director Dorothy Lyman, which has been receiving constant praise during its run at Theatre 54 at Shetler Studios. Set in the present day, the play centers on the story of Elizabeth, an elderly widow living on a farm, who is being pressured by her daughter and son-in-law – and for at least partially self-motivated reasons – to move to a retirement community closer to them in Florida, with Elizabeth refusing stubbornly to let go of her move, and move on from the memories she associated with it. This play indeed is what we think of when we think of an old-fashioned, well-written American drama set in a contemporary setting. With the help of some intelligent and emotional dialogue, this play triumphs in drawing people into the lives of these characters, and exploring the motives and psychology behind them. While it is bound to be particularly relatable to those who’ve dealt with a similar situation with an aging family member, all theatergoers will leave with an appreciation for this story, and perhaps thinking about similar stories in real-life. It helps that the show has such a strong cast of actors. Not only is Ms. Lyman’s writing talent on full display here, but so is her acting ability, as she succeeds in delivering an emotional and nuanced performance in the lead role of Elizabeth. Also offering a stand-out performance is Abigal Hawk in the role of daughter Betsy, whose outburst toward the climax of the play proved to be one of the more powerful moments in this captivating play. The cast is rounded out by Tim Bohn as Betsy’s husband Tom, Jeanne Lauren Smith as granddaughter Liz, Brennan Lowery as Liz’s boyfriend Jason, and Shannon Stowe as farm worker Christie. In her playwright’s note, Ms. Lyman writes, “As an old woman now, no one is telling my stories, so I have to tell them myself.” With this work, she’s done an excellent job at precisely that, and I applaud her and the rest of the show’s creative team for bringing it to life. There are still a few more performances left, as of this review, so consider stopping by Shetler Studios, and seeing this while you can. 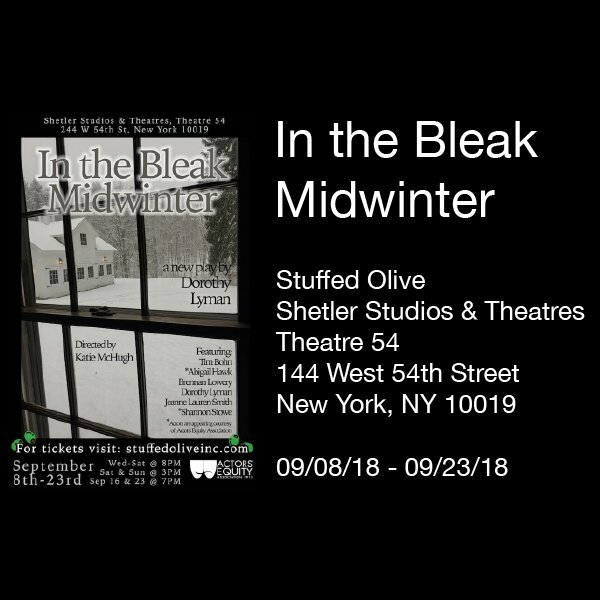 “In the Bleak Midwinter” runs at Theatre 54 at Shetler Studios from September 8th-23rd.